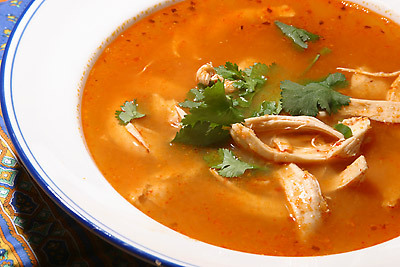 Spicy soups can be very refreshing during the summer. Tortilla soup is smokey from the Chipotle peppers, which also give it a little kick. We love having this soup with a couple of quesadillas. The soup is light and its spiciness counters the quesadillas perfectly. The recipes comes from America’s Test Kitchen. It may looks a little daunting, but it is really easy and comes together pretty quickly. Instead of using fresh tomatoes, I used a 28oz can of diced tomatoes. 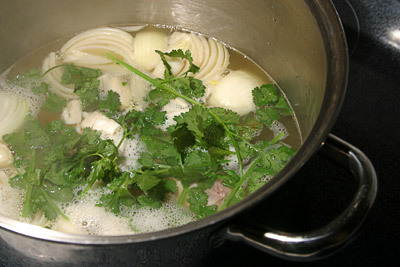 Bring chicken, broth, 2 onion quarters, 2 garlic cloves, epazote, and 1/2 teaspoon salt to boil over medium-high heat in large saucepan; reduce heat to low, cover, and simmer until chicken is just cooked through, about 20 minutes. Using tongs, transfer chicken to large plate. Pour broth through fine-mesh strainer; discard solids in strainer. When cool enough to handle, shred chicken into bite-sized pieces; discard bones. Puree tomatoes, 2 remaining onion quarters, 2 remaining garlic cloves, jalapeÃ±o, chipotle chile, and 1 teaspoon adobo sauce in food processor until smooth. 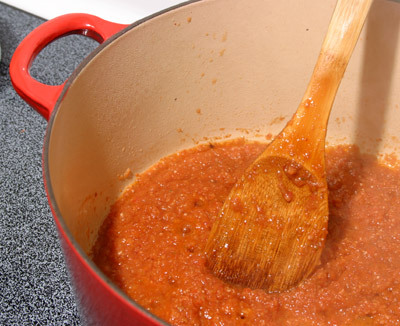 Heat oil in Dutch oven over high heat until shimmering; add tomato/onion puree and 1/8 teaspoon salt and cook, stirring frequently, until mixture has darkened in color, about 10 minutes. Stir strained broth into tomato mixture, bring to boil, then reduce heat to low and simmer to blend flavors, about 15 minutes. Taste soup; if desired, add up to 2 teaspoons additional adobo sauce. Add shredded chicken and simmer until heated through, about 5 minutes. To serve, place tortilla chips in bottom of individual bowls and ladle soup into bowls; pass garnishes separately.